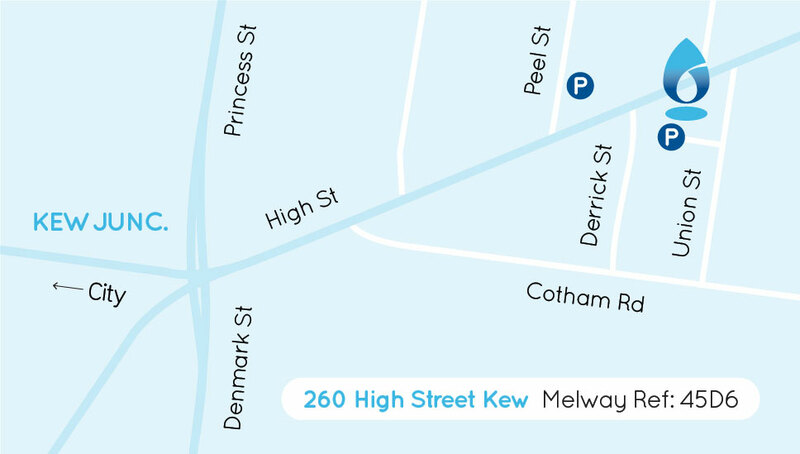 Restore Physiotherapy is located at 260 High St Kew, opposite the Holy Trinity Church and a few doors down from the Kew Post Office (Corner Union Street). There is a tram stop (no 34) on route 24 or 48 and pedestrian lights at the front of the building. Glenferrie station on the Lilydale/Belgrave Line is located a 20min walk away. We have limited on site car parking available under the building (enter off Union Street). Two public car parks are also located nearby in Peel St.
We require 24 hours notice for rescheduling or cancellation otherwise a cancellation fee will apply. As a service to our clients a SMS can be sent to your mobile as a reminder and confirmation of your time.